During Hurricane Sandy the seas rose a record 14-feet in lower Manhattan. Water flooded city streets, subways, tunnels and even sewage treatment plants. It is unclear how much sewage may have been released as plants lost power or were forced to divert untreated wastewater into the Hudson River. Four days after Sandy, the environmental group Riverkeeper attempted to measure the storm’s effect on water quality. If the river had been widely contaminated, by then, any evidence had washed out to sea. A week later, Sandy was followed by a more typical nor’easter. 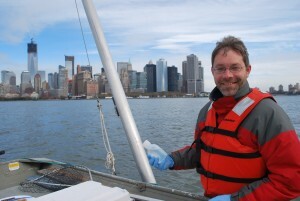 Andrew Juhl, a microbiologist at Columbia University’s Lamont-Doherty Earth Observatory, joined Riverkeeper the next morning to test the waters again. He and Riverkeeper captain John Lipscomb were curious to see what mark both storms had left. JUHL: A little more than a week ago this area got hit real hard by Hurricane Sandy. And that caused a lot of flooding and infrastructure damage. Now that recovery efforts are well underway, but we’ve been getting a lot of questions about what the water quality is like… We can’t actually tell without going out and sampling. On a blustery November morning, Juhl and Lipscomb pulled away from Westerly Marina in Ossining N.Y. Today, their first stop is an outfall pipe off Piermont Pier, where the Orangetown, N.Y. sewage plant releases its treated wastewater. 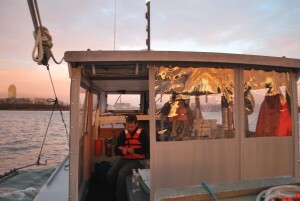 The boat rocks as Juhl hangs over the side to scoop up a sample. In six years of testing, this spot often turns up unacceptable levels of enterococcus bacteria, an indicator for raw sewage. After Piermont, they will grab samples off Yonkers, Harlem, Midtown Manhattan, Hoboken. The sampling will end in Newtown Creek, the federal Superfund site that divides Brooklyn and Queens. In several batches, Juhl will mix the samples in a medium that allows the enterococcus to grow. The bacteria will then be processed and counted and the results made public on Riverkeeper's website. Four days after Sandy, Lipscomb measured high enterococcus levels in Brooklyn’s Gowanus Canal. Today, he and Juhl see continued signs of trouble. JUHL: We noticed as we were coming in that the water was sort of grayish…Then we could actually see a very slow flow of gray water coming out of the discharge. There was a faint smell I caught every once in a while that suggested this was maybe combined with some sewage. It wasn’t just street runoff. JUHL: It’s dry weather right now. That discharge should not be flowing during dry weather. So, assuming that we find that there’s high levels of sewage indicators in that water which I think is very likely there will have to be notification of that. There may be an infrastructure problem there. We’ll find out in 24 hours. From Gowanus, they head to Newtown Creek. LIPSCOMB: Newtown Creek is…Newtown Creek. Above the bulkheads lining Newtown Creek, smokestacks, mountains of crushed cars and mammoth oil tanks loom, a reminder of New York City’s industrial past. As Juhl jots down the creek’s pH and other parameters, he double-checks his instrument. Dissolved oxygen levels are 30 percent, an abnormally low level, even for water as polluted is this. But the instrument is working. The low oxygen levels could be a product of colder temperatures inhibiting algae growth, or it could be something more sinister. Something to investigate next time, says Juhl. The sun is now setting, turning the Manhattan skyline gold. Lipscomb drops Juhl at a dock in Greenpoint. He waves goodbye while pointing his boat toward a bulkhead where he will tie up for the night. A day later, Juhl reviews their results from his office at Lamont-Doherty in Palisades, NY. JUHL: About three-quarters of our samples were unacceptable. And we’ve seen this before. This is what happens when it rains around New York City and other parts of the Hudson Valley. When it rains, that triggers CSOs (Combined Sewer Overflows). Sewage gets released and you see widespread contamination and that’s something that happens here all the time… If there was any impact of the hurricane, that went away. But because we got another storm behind it, we got another contamination event. JUHL: There is a second story there, If you drill down a little further and look very specifically, for example at Gowanus Canal, the Piermont sewage treatment plant outfall, at the Yonkers sewage treatment plant outfall, the numbers there are very high. At Gowanus Canal, once again we had more than 24,200 enterococcus cells per 100 ml. That’s really, really high! We don’t know how high it was. We just know it was greater than that. It maxed out our ability to measure. Same thing for Piermont treatment plant. Those kinds of really high counts are what you expect when we have some sort of infrastructure problem. JUHL: This is where it’s really nice to have a partnership with an organization like Riverkeeper. They’ll be able to follow up with the city and the state agencies that are responsible for managing the system, and hopefully we’ll see some action to fix the problems. It’s very possible that the infrastructure problems that we’ve discovered are not known to the people who are running the sewage treatment plants.